1. What is Your Greatest Strength? 3. Tell Me About Yourself? How should you answer questions about your strengths? The best way to respond is to describe the skills and experience that you have which directly correlates with the job you are applying for. Be prepared to answer by making a list of the qualifications mentioned in the job posting. Then, make a list of your skills that match those listed. This list can include education or training, soft skills, hard skills, or past work experiences. Narrow your list of skills down to 3 - 5 particularly strong skills. Next to each skill, note an example of how you have used that strength in the past. This will prepare you for when the employer asks you to elaborate on a particular strength. When you answer, you will be sharing strengths that match the qualifications the company is seeking. Also incorporate these power words that help make a good impression into your responses. What's the best way to talk about weaknesses at job interviews? It's important to respond carefully because you don't want the hiring manager to think that you're not going to be able to do the job. There are several different ways to answer when you're asked during a job interview what your greatest weakness is. You can mention skills that aren't critical for the job, discuss skills you have improved on, or turn a negative into a positive. One approach to answering this question is to analyze the key skills and strengths required for the position you are interviewing for and then come up with an honest shortcoming which is not essential for success in that job. Another option is to discuss skills that you have improved upon during your previous job, so you are showing the interviewer that you can make improvements when necessary. You can sketch for employers your initial level of functioning, discuss the steps you have taken to improve this area, and then reference your current, improved level of skill. If you use this strategy be sure not to mention anything that you improved upon that is related to the job for which you are interviewing. You don't want your qualifications for the job to be questioned. Interviewers will sometimes start an interview with an open-ended question like "Tell me about yourself." It's a way to break the ice and make you feel more comfortable during the interview process. It's also a way for the hiring manager to get insight into your personality to help determine if you're a good fit for the job. Sharing too much or too little information isn't a good idea. The interviewer doesn't want to know everything about you, but disclosing too little can make him or her wonder why you aren't more open. Although it might be tempting to share a list of your most compelling qualifications for the job at hand, a more low-key approach will probably help you to develop a personal rapport with your interviewer. Try starting out by sharing some personal interests which don't relate directly to your work. Examples might include a hobby which you are passionate about like quilting, astronomy, chess, choral singing, golf, skiing, tennis, or antiquing. Interests like long distance running or yoga which help to represent your healthy, energetic side are worth mentioning. Pursuits like being an avid reader or solving crossword puzzles or brain teasers will help to showcase your intellectual leaning. Interests like golf, tennis, and gourmet food might have some value if you would be entertaining clients in your new job. Volunteer work will demonstrate the seriousness of your character and commitment to the welfare of your community. Interactive roles like PTA volunteer, museum tour guide, fundraiser, or chair of a social club will help show your comfort with engaging others. After sharing a few interesting personal aspects of your background, you can transition to sharing some key professional skills that would help you to add value if you were hired for your target job. Consider using phrases like "In addition to those interests and passions, my professional life is a huge part of who I am, so I'd like to talk a bit about some of the strengths which I would bring to this job." Be ready to share three or four of the personal qualities, skills and/or areas of expertise which would help you to excel in the job for which you are interviewing. Ultimately, you will want to share several other strengths before the interview is over. Make a list of your strengths before you go into the interview, so you know what you will share. Look at the job description and match it with your skills. Then share the top few skills which make you an ideal candidate for the job. However, be careful not to overwhelm the interviewer with too much information. After mentioning three or four strengths, you might mention that you have several other assets which you would like to discuss as the interview unfolds. At first, you should only mention the asset and allude only briefly to some proof of how you have tapped it to your advantage. For example, you might say that you love to give presentations and that has helped you to generate lots of leads at sales dinners for prospective clients. Later in the interview, you will want to be more specific and detailed in discussing situations, interventions and results flowing from your strengths. Typically, you would steer clear of controversial topics like politics or religion. It's important to avoid any references to topics that would cause concern about your ethics, character, productivity, or work ethic. You also don't need to share personal information about your family. There is no need to discuss spouses, partners, children, or any other strictly personal information. watch out for more on interview questions to expect. 1. What can you tell me about yourself? 2. Can you list your strengths? 3. What weaknesses do you have? 4. Why should I consider hiring you? 5. Where do you see yourself five years from now? 6. Why do you want to work here? 7. What is your salary expectation? 9. What makes a good team player? 10. Is there anything that you would like to ask me? It is fair to say that you might not be asked every one of these questions at an interview. You may even be asked other, more bizarre ones, like ‘if you were an animal, which would you be?’ Such questions are designed to see how good you are at thinking on your feet so you cannot truly prepare for them. Just relax and say something sensible. For the other common interview questions, consider how you might answer them before you get face-to-face. Talk about yourself in summary and avoid rambling. Your detailed work history can be found on your CV, after all, so focus on elements that you want to highlight rather than going through everything. It is okay to discuss your personality and what ambitions you have. Ideally, you will give the interviewer a positive insight into how you would fit in as an employee. Never say that you have no weaknesses. Everyone who does this comes across like they have simply not prepared for the interview. Likewise, avoid giving yourself a back-handed compliment, such as, ‘I work too hard.’ Remember that being able to identify a weakness is a strength. Focus on an area of your work that needs to be improved. You might have been trained in something that you’d like to take to the next level, for example. Point out that this is a weakness, but something you have identified and are focusing on resolving. Interviewers want to understand that you have the ability to be honest about yourself and to seek self-improvement. If you are highly qualified for the job you are applying for, then you should point this out, but don’t forget that other people being interviewed may match or exceed your suitability. In such cases, focus on what else you can bring to the job, perhaps with your soft skill set, like being able to integrate well with existing members of the team, for instance. Don’t give up on an interview if you´re not fully qualified for the job. Appeal to the interviewer’s desire to hire someone with drive. If you are not the finished article, then point out how keen you are to learn and be mentored. Accentuate the positive aspects of what you can do now and how quickly you will be able to progress with what you don’t know if hired. This is your chance to talk about your wider ambitions and goals. It is okay to say you’d like to progress on from the position on offer in most cases. Bosses want to hire people with determination so don’t be shy about sounding ambitious or hungry for success. Ideally, try to contextualise your ambitions within the organisation that you are applying to join because this tends to go down better. This is your chance to show that you have researched the company you are applying to work with. Avoid saying anything negative about your current employer which makes it seem you are simply after any job at all. Typical things you might say are that the company operates in your chosen sector, that it provides a clearly structured career path and that the organisation has a good reputation. Don’t simply trot these ideas out, though. Do your research! This is one of the most troublesome questions for many interviewees. For some people, however, it causes no bother at all. It will depend on your personality as to how you feel talking about salary expectations. That said, there are some tips to help you deal with the question. Firstly, it is okay to talk about pay in terms of ranges and not to be specific about a particular number. It is also okay to include other benefits, like healthcare, pensions and time off within the context of salary. Make sure you have looked at other, similar jobs being advertised in other organisations so that you have an idea of the pay rate in the market. Motivation is personal, so there is no wrong answer that you can give. It might be down to your desire to succeed and build a career, but it might also be because you want to provide for your family both perfectly good answers if you choose to give them. In some professions, caring or vocational motivations might be worth mentioning, too. Many people say in their CV that they are good at working cooperatively or are team players, but few say what this actually means. Think about examples from your past that demonstrate your ability to build bridges, form networks or simply get on with people. This needn’t be from your professional life. You could cite any examples from clubs or organisations to which you belong. Answering this question well is especially important for people who want to be team leaders or to manage a department. Always have at least one question prepared in advance. This is your chance to drill down into an area of the business that might not have been covered in the interview. Alternatively, you may simply like to ask for feedback on how you have done in the interview. A good tip is to pick up on something that has been mentioned in passing by the interviewer about the job. Ask him or her to expand on this. Not only does it make you appear interested, but it shows that you have been listening attentively to what has been said. It should leave the interviewer with a good final impression of you. These ten questions are certainly not the only ones that can be posed, but they are the most common ones. Remember that you don’t need to answer all questions at an interview if you feel they are too personal or you are not comfortable with them. Getting yourself prepared for common questions is necessary prep work before attending an interview. Don’t make the answer come across as rehearsed; rather, just remember the gist of your answer and then let the sentences flow freely during the interview, which gives the interviewer a much better impression of you. Watch out for more on this topic in next publication. This is the list of issues belating progress in The Federal Government of Nigeria, that was voted on yesterday 26th of July,2017 by the National Assembly. I will commend them for some of the decisions made, which Nigerians can be rest assured will go a long way to help in the advancement of the Nation. 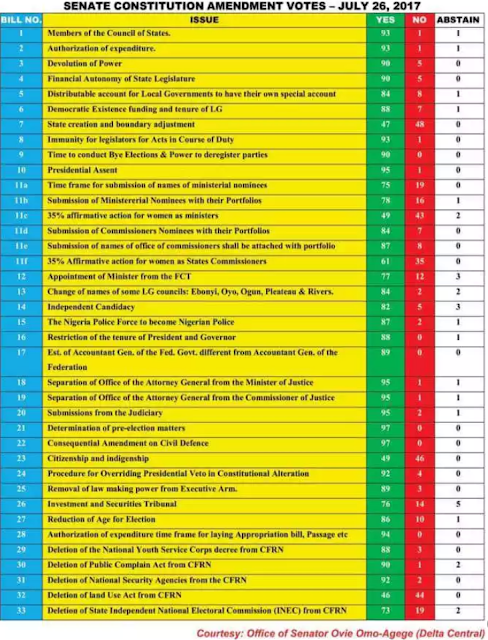 The amendments of age limits for presidency and governorship contesting is a good one as there was no real tangible reason for the age barrier limit before. The amendment on percentage of women being nominated for ministerial n commissioner positions both in national and state level is good too as women will be given more chance to be involve in governing. Whats up with the `immunity for legislators for Acts in course of Duty`? Does it mean that whatever the legislators do during the course of duty is ok? Does it mean whatever is done during the course of duty is not liable to be indicted for? The amendments on `Restriction of Tenure of President and Governor`, was that done because of only the former President Dr. Goodluck Jonathan, or was it for the benefit of Nigerians? Music is said to give an outlet to our deepest yearnings,this song puts things in context as to the position our nation holds or should hold in our hearts. Until we as individuals take on the burden of rectifying that which is faulty about the nation, we will not be able to see the beauty of patriotism. Enjoy the tune...and reflect on your role in moving the nation in the positive direction. Fresh tune from Mama Africa's son Stylo-"Naija ma Country"
know is away from the country on medical vacation. strength and confidence as we faced the challenges of the past two years. office: these were Security, Corruption and the Economy. mindless killings, as far away as Abuja, Kano And Kaduna. up of the Niger Delta beginning with Ogoni-land, which we launched last year. reforms is to dedicate some specific courts to the trial of corruption cases. fertilizer and petrol subsidy regimes. most ambitious in the history of the country. 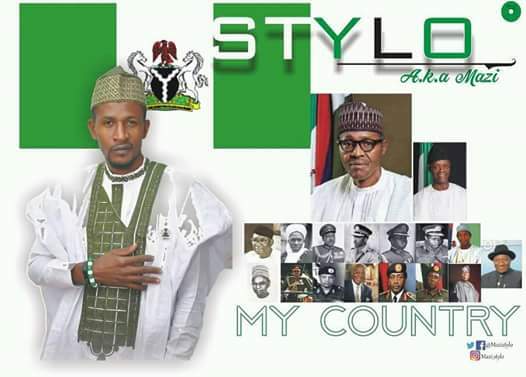 yet lasting impact on the lives of Nigerians. deserve as citizens of Nigeria. have led to foreign exchange savings of US$200 million; and subsidy savings of 60 billion naira. All of this is evidence that we are taking very seriously our ambition of agricultural self-sufficiency. for the economic development of Nigeria. I will come back to this point presently. Arrival scheme, to reforms at our ports and regulatory agencies. government approvals, support procurement of locally made goods, and improve fiscal responsibility. budgets work more efficiently for the people. all other states in due course. that you will soon begin to see the positive impact of these steps. seen the flowering of the early fruit of all the hard work of our first eighteen months. another milestone in the history of this country. Our 2017 Budget will double that investment. income individuals and families across the country. fulfilling all that we promised. In the next two years we will build on the successes of the last two. environment to invest and do business. and female as they invest in diverse areas of the economy. – will no longer be standard operating practice; a land rid of bandits and terrorists. needed to create that country of our dreams. overnight, and we simply do not expect overnight solutions to our challenges. frustrations will arise from time to time. brought us all together as brothers and sisters and citizens. desires, and to resist all who might seek to sow confusion and hatred for their own selfish interests. and strength and the safe return of our President.